A while ago I shared a photo of my pesto pizza creation on Instagram and Facebook asking whether any one would like to trial the recipe. Thinking perhaps a couple of people would respond, I ended up having over 200 requests and since then the response from those that have made it has been incredible. I have been so happy to have received messages, in particular from Type 1 and 2 Diabetics who have spent years and years (one man in particular has spent two decades) dosing themselves up to the eyeballs just to enjoy a slice of pizza and still riding hypers (highs) hours later. Messages flooded in from ecstatic individuals suddenly finding they could enjoy all the cheesey, springy, doughy goodness but without any blood sugar high or insulin overdose. For almost 12 years I avoided pizza, a bit like pastries, sweets and other high sugary treats. Things that the majority of people don’t have to think twice about. It is amazing just how ill eating something that should be enjoyable can make you feel. Of course, I have certainly had times where temptation wins over but on top of fighting high and then low sugar levels, there is nothing worse than having to count how many carbs are in what should be an enjoyable feast. Going to an Italian restaurant and ordering a salad, just doesn’t really have the same enjoyment, especially when watching everyone around you tuck in to a Calzone, all mmmm’ing and agreeing at how wonderful it is. You can’t quite do that with a lettuce leaf and a beef tomato. 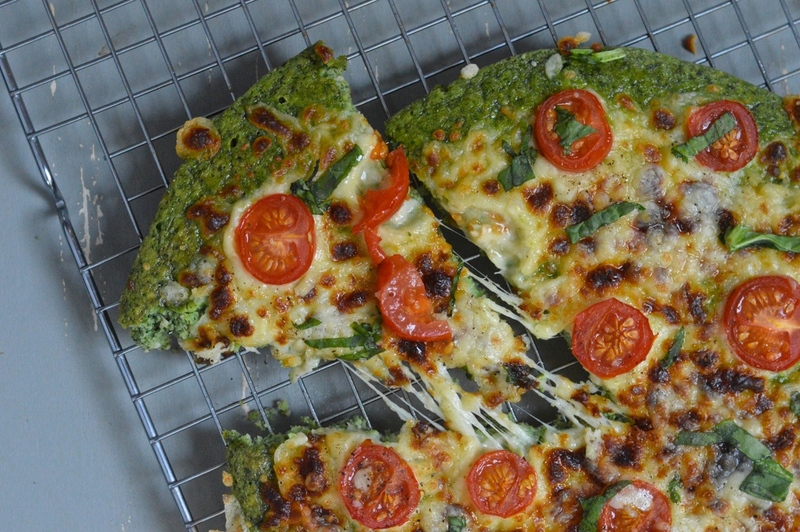 This pizza is flavour to the max. It’s also incredibly easy to make and can literally go from pan to plate in 15 minutes. It is as great cold as it is straight from the pan and you can, of course, add any other topping you desire. If you cannot tolerate cashew nuts then you could substitute them for pine nuts or another nut or seed of choice. For me I do not require any insulin for 2 or 3 slices, obviously this will not be the same for everyone and you should adjust your doses accordingly and always monitor your glucose level before and after eating any new food. For those carb counting, there are approximately 17g carbs for the whole pizza. Each pizza has about 8 medium slices = 2.12g carbs per slice. You can thank me later! I am also very excited to share my first recipe video. Having spent far too long trying to make the perfect Nigella-esque video, I decided that I simply cannot stand myself on camera and as to avoid putting anyone off their pizza, I have made the video, as simple as possible. I hope you enjoy it. 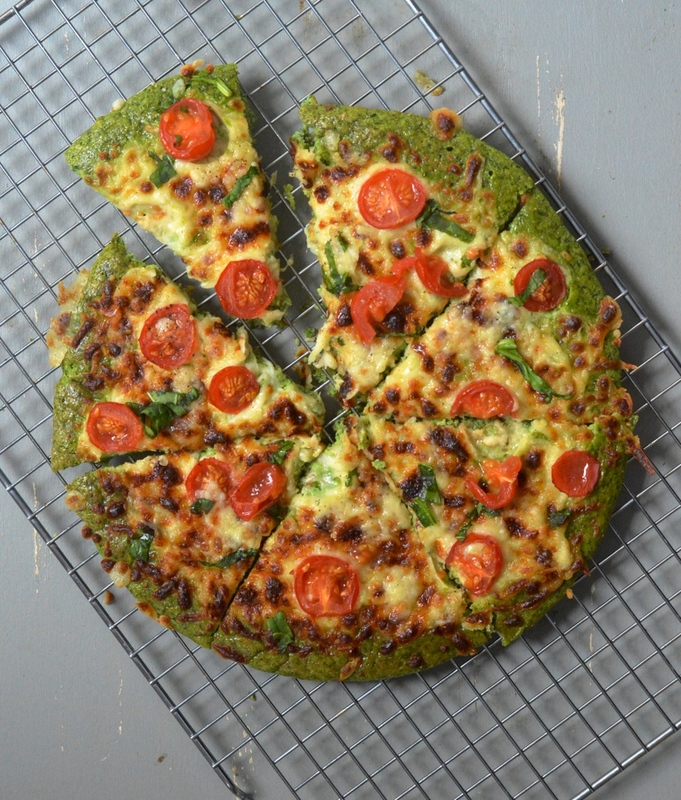 A delicious low carb pesto pizza that the whole family can enjoy. In to a blender / food processor place the cashew nuts, spinach, basil, olive oil, sea salt, garlic and water. Blend until smooth and creamy. Transfer mixture to a large bowl. Add in the eggs and beat in to the mixture until fully combined. Now add in the coconut flour a little at a time (you don’t want any lumps! ), mix in until all blended together. In a non stick frying pan over medium heat pour in the mixture until it evenly covers the bottom of the pan. Cook for 6 minutes until you can see the sides lifting a little. You should be able to lift it a little with a spatula to see that the bottom has cooked. Transfer to the grill and cook for 5 minutes before carefully removing and adding the mozzarella, tomatoes and some optional cracked black pepper or dried chilli flakes. Place back under the grill for about 3 minutes until the mozzarella is melted and golden on top and the tomatoes are softened. Garnish with some fresh basil, slice up and enjoy! Alternatively allow to cool before popping in a tupperware and keeping in the fridge until required. Some coconut flours are more dense than others and soak up liquid faster- you don't want to leave the batter too long as it will get too thick. Add 1 or 2 extra tablespoons of water if needed to ensure a smooth pourable batter.